Dinner in 20 minutes or less! 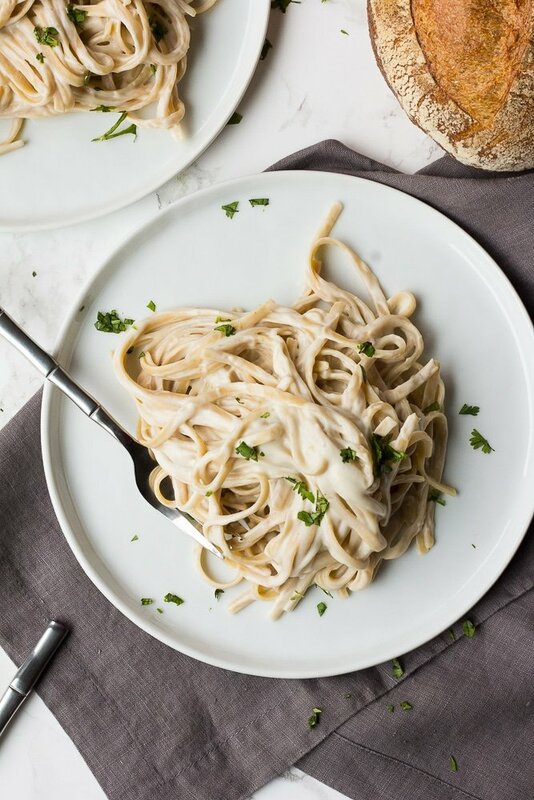 Meet the creamiest Vegan Alfredo Sauce, made with cauliflower (frozen for super easy, or fresh), a little bit of cashews and a LOT of garlic. 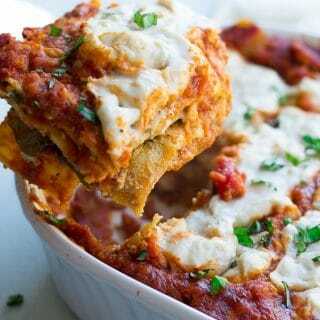 Serve with fettuccine and steamed broccoli for a quick, amazing meal that won’t weigh you down! 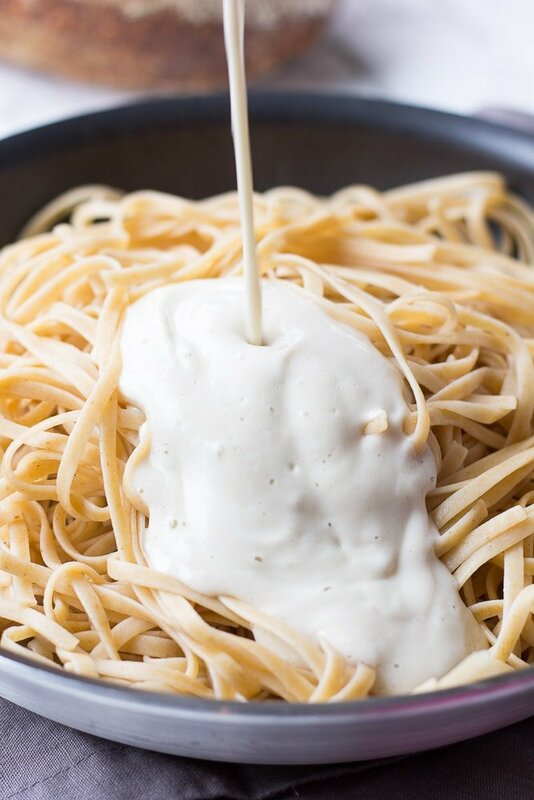 I am SO in love with this vegan alfredo sauce; you have no idea. I’ve seen cauliflower sauces before, and even tried one once, and thought, “meh…” Kinda watery, definitely not super creamy like I wanted. 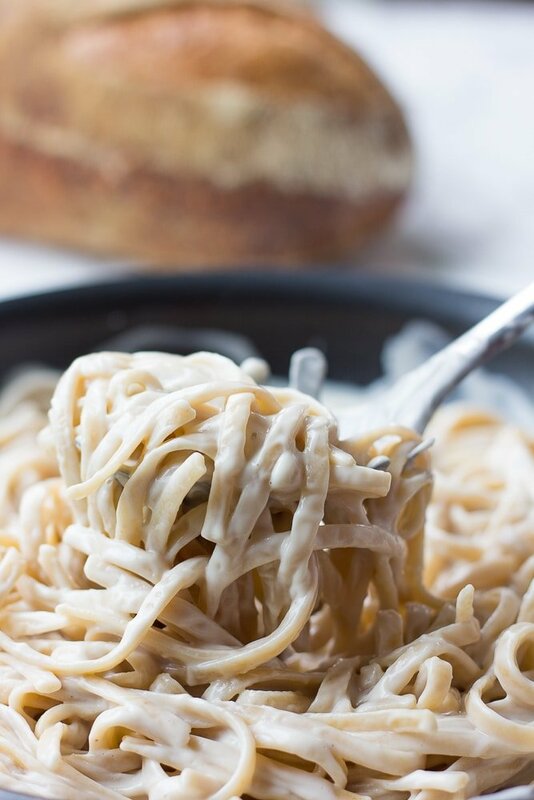 I wanted to make a vegan alfredo sauce that was incredibly rich tasting, like the dairy version, but made with whole food plant ingredients. Plus, I wanted to make it super simple and quick. 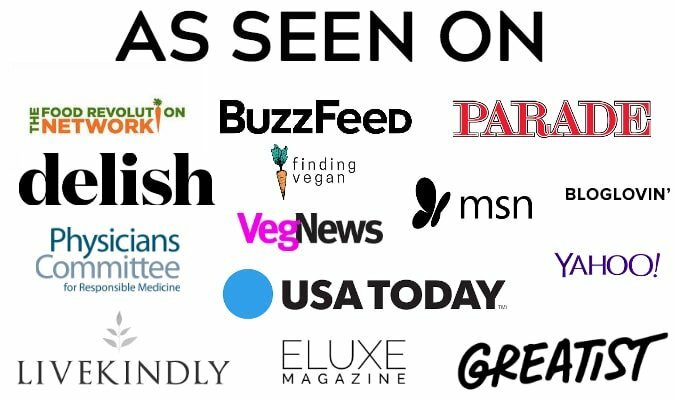 You see, before going vegan several years ago, the husband and I would go to The Olive Garden pretty frequently. And every time, I would get the Fettucine Alfredo. It tasted so good, but I’m telling you, I would feel sick just about instantly from it and stay that way for several hours. It was greasy and dairy filled. Yuck. Why did I continue to do it over and over again? I don’t know! I wasn’t very in tune with my body’s signals that were screaming at me to eat something different. If you don’t have an Instant Pot, don’t worry. 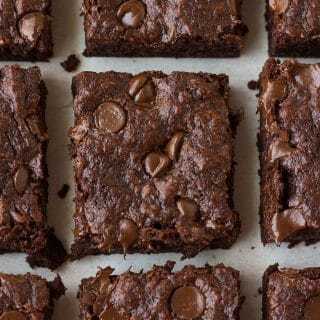 You can still make this recipe, almost as quickly. I’ve included both Instant Pot and regular instructions. Inspired by Oh She Glows. 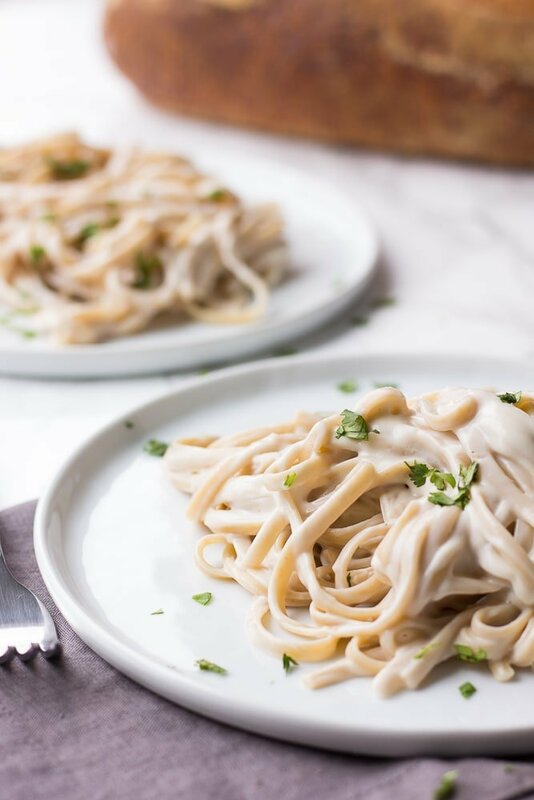 Made in the Instant Pot (or not), this Vegan Alfredo Sauce will have you licking the blender clean! 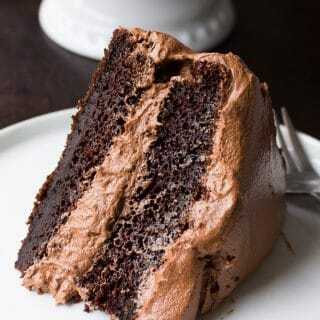 It's rich, creamy and made with whole food plant ingredients. Push the saute feature on the Instant Pot. Add the olive oil and minced garlic and cook for a minute or two, until fragrant, but be careful not to burn. Now turn off the saute, and add the cauliflower, cashews and vegetable broth. Cook in the Instant Pot on high manual pressure for 3 minutes, making sure it's sealed so the pressure can build. Transfer to a blender, add salt and blend until very smooth. Pour over pasta and stir. If the sauce is a bit thick, simply add in a few tablespoons of water, a little at a time, until the desired consistency is reached. Serve immediately with steamed broccoli, kale or peas if desired. In a large pot, saute the garlic in the olive oil for a few minutes until fragrant. Add the cauliflower, cashews and vegetable broth. Bring to a boil and cook for 10-15 minutes. Transfer to a blender and blend until smooth. Return to the pot, add salt to taste and serve. This sauce freezes well. I freeze sauces like this in small glass or BPA free plastic containers. Leave an inch or so of room for expansion. Re-heat in the microwave, stove top or even your Instant Pot. Use Gluten Free pasta if needed. This sauce is good on all sorts of pasta, and makes a great topping for baked potatoes as well. You may leave out the cashews if necessary, such as if you have a nut allergy or don't want the fat. It will still be good but not quite as creamy and you will need to use less vegetable broth. You could also try replacing the cashews with white navy beans. 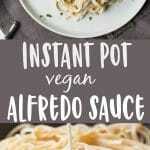 I love this sauce with pasta and steamed broccoli or cooked kale. Nutritional information is only for the sauce. It will change depending on what kind of pasta and vegetables you use.